The harness inspired by the unique shape and needs of the dachshund. AVAILABLE FOR ANY BREED. This is the one! The original vest-style harness. Accept no imitations! If it doesn't say Hug-A-Dog on the label, it's just a copycat! 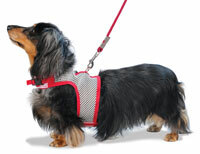 This comfortable-fitting walking harness is easy on the dog and the owner. Made of durable, cool, poly-knit mesh. Easy to put on with hook & loop closures (like Velcro®). No straps. No rubbing or choking. Transfers pulling pressure to chest area. Washable and dryable. I purchased this harness for my 6 year old Doxie, Ellie. I adopted Ellie from rescue; she was wearing one the day I picked her up from her foster mom. There was a business card for the Dachshund Delights website in my adoption packet, so I decided to order her one. I love that there are so many color and accessory options and that the harnesses are handmade right here in my beautiful home state of Ohio! I received my order promptly, and both Ellie and I love it. The harness looks good, is easy to get on and off, and fits perfectly. I will happily recommend Dachshund Delights in the future! Thank you for the perfectly fitting harnesses. The boys,Freddie and Alfie look very smart in them.Dachies always have the Ahhh factor but with their new harnesses they always get stopped and admired With no buckles under their armpits they are now free from any chaffing and soreness that they experienced with other harnesses. I feel I need to draw attention to the extra cost incurred on buying from outside the UK Although we knew to expect a tax coming into this country we were not expecting the additional payment of £8 from the PO for collecting that tax payment so UK residents please beware. That said we the dogs and the owners are extremely pleased with our purchase and the speed at which they arrived. Great harness! Fits fine and looks very nice in brown and black. Our Dachshund is very comfortable in it, and we have a better handle on his strong pull without putting stress on his neck. Good workmanship, worth the money. first harness that actually fits my wiggly dachshund! easy to get on and off, super simple. 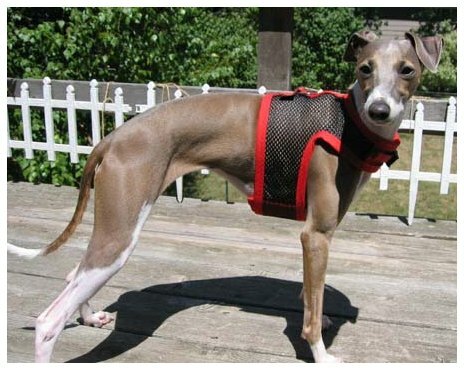 Doesn't give him rubs or irritates his stomach/under-arms like other harness products have. So far, LOVE IT! There is no substitute! I bought my last pair 11 years ago, and with hiking, biking, swimming, kayaking, living in 3 countries and 4 states, we finally decided to upgrade. We put them to the test!! My new pair still have the same high quality, fantastic construction, and fit perfectly, which is hard for barrel chested dachshunds. My boys never tug at them like they might be uncomfortable, the will even take naps with them on. I was thrilled when I found them 11 years ago, and would have never considered any other harness. This is the only harness I have found that works on a dachshund. I have ordered this item several times & recommend it to everybody. Love it love it!!!! This harness is just awesome! After purchasing several different types of collars and harnesses I was convinced I would never find something for my dachshund puppy that pulls constantly. This is the answer to my prayers!! The harness fits perfectly and I no longer have to worry about his neck when he pulls. I am really impressed with the quality of this product and recommend it highly for anyone with a dachshund so that you can protect the neck. I am so happy with this harness that I have already ordered another in the fabric - mesh combination. You won't go wrong with this one! My sweet almost 6 year old mini dachshund, Sasha Sugar, received the Hug A Dog Harness and she and I couldn't be happier. Our walks are so much better now that I don't have to pull her neck with a leash on a collar. The custom fit was perfect. We purchased our 3 doxies new Hug A Dog vest because the original ones were 9 years old and we wanted them to have something new. they are very well made and are still used when the dogs want to roll around in the dirt. this way we can keep their new ones looking like new. You can't go wrong with these hi quality vest. 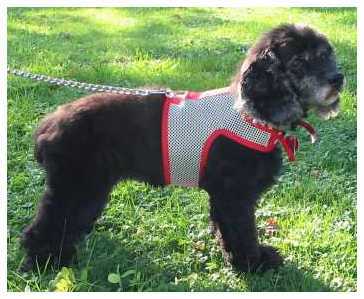 We also have a variety of other vest from the doxie delights sight. for colder weather or when we want to show a little more Bling. They are worth every penny! We originally order these harnesses for our long-haired dachshund Jenny and after she died this past summer, we promptly adopted 2 more dachshunds. Well of course we once again order two more harnesses from Hug-a-Dog for them, Kanga & Roo, because there is no better harness on the market. Pixie just loves her harness. I love the fact that it doesn't choke her when she gets excited or I have to steer her. It has surpassed my expectations in craftsmanship. Sturdy and lightweight design yet powerful and safe enough to keep my 20 pounds of joy in check. Next on Pixie's list is a custom coat for winter. This is our second Hug-a-Dog harness; the first one giving out after about 5 years because the velcro wore out. We're using a harness instead of a collar because of the delicacy of a Dachshund's spine. We're delighted with this harness. Great product. Fit is perfect. Shipped within time limit. I would definitely order from you again! 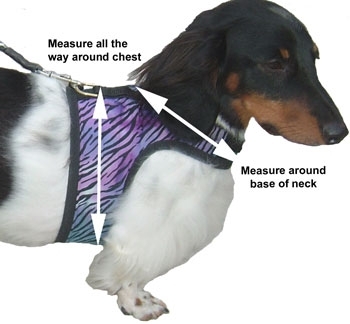 We just love the "Hug-a-dog" harnesses from Dachshund Delights! This is our third one we've purchased over about 10 years and we love the fact that the old ones are repaired and donated to dachshund rescue. What a great product! After trying to fit my miniature Dachshund with a harness and failing miserably, I decided to order this harness. I LOVE it! It fits him perfectly and looks great. I've washed it several times now, and it washes very well. I'll probably order a second one to rotate with this one and a fleece or coat as well. I would and have recommended this harness to friends with dogs who aren't Dachshunds. Nothing beats a harness that fits perfectly. Thanks!! I have ordered many of these harnesses over the years (I have a house full of weiners) and have never been disappointed. The harnesses are superior quality, fit perfectly, prevent stress on my dog's back and neck and look great on them, too. Not to mention how easy they are to put on and never come loose or allow the dog's legs to slide out. I receive many compliments and requests for the website. You can't go wrong ordering from this company. The others are just not the same! I have wasted so much money on harnesses that did not fit my dachshund. This harness is perfect. Fits him exactly the way it should. I wouldn't even consider another harness. It is easy to put on, take off and looks so nice on him. Love these harnesses for my dachshund. They are comfortable and highly functional. In fact, Ingrid won't let me put any other kind of harness on her! Great quality and customer service. I now have three of your harnesses for my mini wire haired dachshund, they are the best! They hold up very well, wash up beautifully. The quality of the workmanship is excellent! This harness fits perfectly, which makes wearing it so comfortable. There's never any pull or choking on the throat, easy-on & off, and it's stylish as well as practical. I love that it doubles as a great car seat-belt friendly harness, as well. Must have at least one, preferably a collection. Best dog harness you can buy! I have a rat terrier and a mini dachshund. Both are experts at getting out of harnesses! I bought my first Hug a Dog Harness for my doxie, as she was the worst offender. It worked! She couldn't slide out, the key is making sure the harness is not too loose. Here in Florida, I use the mesh harness for comfort from the heat. They fit comfortably and once our dogs got used to wearing them, they get excited when I get them out for a walk. Thank you for these wonderful safe harnesses! I love you harnesses. We are on our third one and third color. My little guy gets so excited when he hears the harness come off the hook. Other walkers always comment on how cute he looks in his (outfit). Can't wait to wear another one out so we can get another color. However that usually takes a few years. Diane C.
I have purchased so many harnesses for my dog with no success. She had managed to pull herself out of every harness previous to the hug-a-dog harness. I have so much relief knowing she is now safe! This is the only product I have found that has custom measurements for chest & neck as opposed to sizing in small, medium & large. The fabric is mesh, so it's light & breathable. Basically, it is the best!!!! We bought this harness as a summer harness for our little Moose. It can get quite hot and humid here in the Great Plains. She also has a fabric and mesh harness for fall and winter, a coat for the winter and a premier DreamSack. As has always been our experience, the quality of all these items is first rate and the workmanship is excellent. I bought a white mesh with royal blue trim for my rescue Dachshund Lionel, it fit perfectly and he loves it. So I bought a black mesh raspberry trim for my 8.5 month old Dachshund pup Sayla, fits perfectly and she loves it. Also I bought a white mesh with royal blue trim for my 9 month old Shichon pup Pooch, fits perfectly and he loves it. Now all three of my dogs have Hug-a-Dog harnesses. Thank you, my dogs are comfortable wearing them and it is easier to take them for walks. 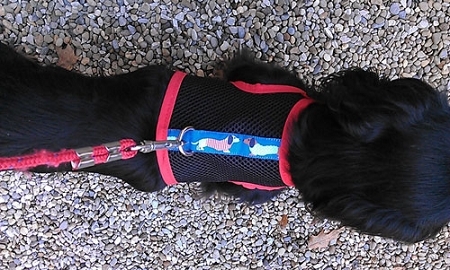 This is our second Hug-A-Dog harness for our miniature longhaired dachshund. We wore the first one out after two years of hard usage, and when it came time to buy a new harness, I looked around the marketplace but never found one that looked or fit as well as this one. We ordered our second one, have had it now for two months, and are completely happy with it. It fits Callie well, and the design works well, keeping her under control yet not putting too much pressure on any one part. We are very pleased return customers! I ordered two custom mesh harnesses for my doxies. They are an excellent quality with perfect fit! They also look great on my dogs. Thanks for your attention to detail, and style! Thanks also for supporting local rescues. This is the only harness I trust that my doxie's cannot get out of it. It leave me with a safe feeling when walking my dogs. I purchased this one for a foster dog that got his forever home ( but it was on a busy street without a fenced in yard ) I sent him with one of mine ( which I've had for 12 years and still good as new)and when his came in we stitched them out. I wanted to know he was safe when he was taken out for his walks . I LOVE THIS PRODUCT AND HIGHLY AND ALWAYS RECOMMEND THEM. It is will worth the $$ to know my fur babies are safe and as I said they last forever Georgia got her's 12 years ago. The absolute BEST harness out there hands down. This was my 5th or 6th harness that I have bought, and I wouldn't use anything else on my doxies! Well worth the money due to the fact that they last for YEARS! 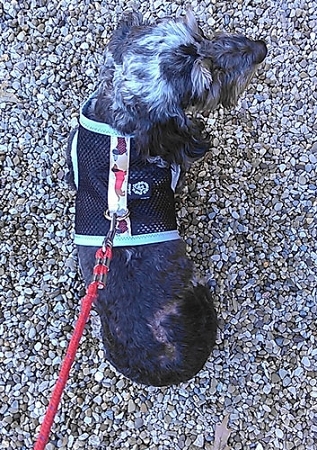 Our Callie, a miniature long hair piebald dachshund, loves her harness! It fits perfectly. It doesn't pull on her neck like a collar and leash did. Happy we found this company! This is the 2nd harness I have purchased and I love them! Quality is superb, the first one I purchased years ago and it has held up after washings and much use-still looks brand new! The fit was perfect, it's easy to follow the measuring guidelines. So many fabric/color choices! A MUST HAVE for all dachshunds! 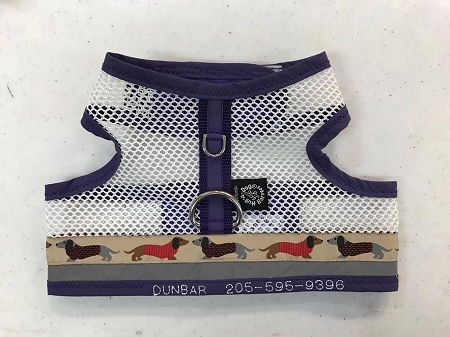 I recently placed an order for what I believe is at least the 14th (maybe more) harness that I have placed over the last decade or so from Dachshund Delights. I would never use another harness on my Doxies. My recent order was for my daughter's new Dachshund pup. Since I own the parents of the pup, it was a pretty safe bet to know what size he would eventually need and ordered it a bit larger than what he is right now. When I use them, I leave the neck portion of the harness attached but loose enough so that it can slip it over the dog's head when putting it on. That way, I simply attach the velcro under their belly and away e go. It couldn't be easier. 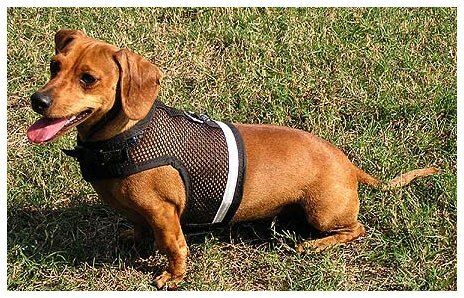 These harnesses are also very comfortable for the dog and wash up easily in the washer and dryer (they get softer, too). 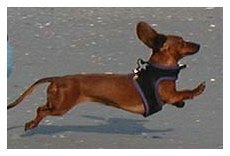 I have always ordered the black mesh with different color trims for my 5 longhair Dachshunds. (We color code the dogs to make it easier to tell whose harness belongs to whom.) I also have their names personalized on the vests. This company is wonderful. The harnesses have always been the same great quality, too. They are much better for the dogs' backs as there is no tugging on their necks. There is no way you won't be happy purchasing one of these for your furbaby! We bought this for my dachsund/beagle mix as his regular harness rubbed him behind his front legs. We got the mesh as we live in the South and it gets HOT. It's easy on and off, durable, and also the company offers to replace the Velcro closures if they begin to wear. Very pleased with it and will most likely buy one for our terrier mix. Best Harness on the Market Today! I have two mini dachs and love your harnesses. I ordered harnesses for them as growing pups and then as adults. These harnesses fit the body of a dachshund when other harnesses will not. I love that I can have my telephone number embroidered on the harness if the pups ever get lost. I forgot to order the extra ring on the last harness. Shucks. I recommend the extra ring so you have a ring for your tags and another for the leash. Mocha & I love her new harness. It's white mesh for summer; we've never had a white one before! 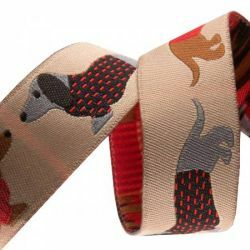 LOVE IT and all our products we get from Dachshund Delights!! 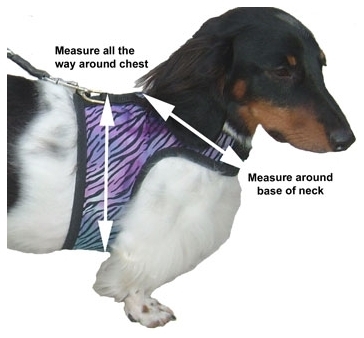 I have 3 dachshunds and have used these harnesses on all. They are the best I have found out there and I have tried several. Save yourself and instead of trying out all the different kinds (like I did) just get this and you will be happy! I have used hug a harness for 15 years and they are the best. I've purchased 3 of these harnesses over the years. These are the only harness that my doxie can not pull or walk out of. I've tried many others and they just don't work for those short legs and barrel chests. These work great in my doxie's car seat. In fact, I keep one permanently hooked to his car seat since he rides so much - just incase he doesn't have his house harness on. I wash (air dry) mine quite often and they hold up well. 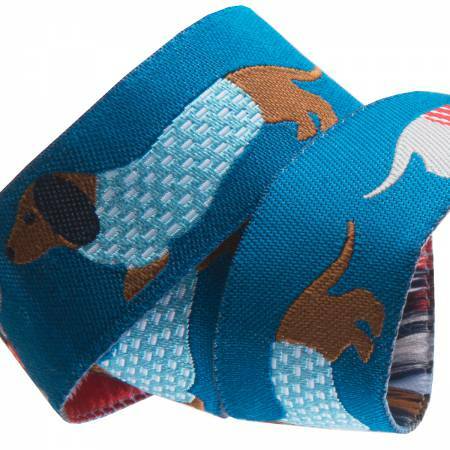 Excellent quality and fit for our dachshunds! We now have purchased 3 vests over the years. The oldest vest is 13 years old and still in great shape! My dogs should age this well. I highly recommend. Great product! This is our second hug-a-dog harness. Wish I'd bought the one with the handle on the back of the harness instead. That's just my personal preference. I am completely satisfied with the harness. It fits perfect and my Beagle seem to like it too--she seems to not even notice it and can still roll in the grass with it on. I feel better about walking her now because the harness is much better for her back problem (Intravertebral Disk Disease). Thanks for making it to fit so perfect. I don't have a dachshund but decided to order the harness anyway--best decision ever! I wish I could include a photo. Great overall fit but best of all no pressure on the throat when out for a walk. Thank you so much!! Hi April and staff, We've just received our mesh harness our 4 yr old wire haired doxie. We are so pleased with the fit, workmanship, and care that has gone into this product. It looks great too. Thank you! We've used these harnesses for our doxies since discovering them years ago on the internet. We're on our third one for our black and tan, Bailey, and are completely satisfied with its design, and functionality. Our older doxie, Macy, passed away last year at 15 years of age. We've got two harnesses we plan to return to Dachshund Delights so that they can be reconditioned and sent out to needy dachshunds. We'll continue to purchase these harnesses as needed. Best one we've ever seen on the market anywhere! The vet recommended a harness for my dachshund. I tried a number of different ones, both from the pet store and online. None of them even came close to the quality and fit of the Hug-A-Dog Harness! It doesn't pull or put pressure on his back or neck, is easy to get off and on, and very sturdy! Thank you for making such a great product!